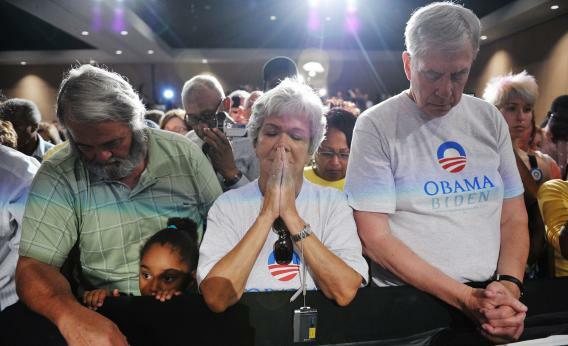 Obama supporters bow their heads during a moment of silence for the victims of the Aurora, Colo., shootings at a campaign rally for President Obama in Fort Myers, Fla. The universe of people who can actually help after a shooting spree is fairly small. Family members. Law enforcement. Reporters. Paramedics. Everybody else is basically talking to make themselves feel better. And so, 30 minutes or so after the news of a shooting spree breaks, we get into the debate about “politicizing” it. Here are some tips on how to endure it. 1.) Don’t worry about new gun laws. If any shooting was going to inspire new regulations, it would have been the January 2011 massacre in Tucson that severely wounded Rep. Gabrielle Giffords and killed a federal judge. Rep. Carolyn McCarthy, a New York Democrat, quickly proposed legislation that would have banned the extended magazines allegedly used by Jared Loughner. It went nowhere in the Republican-led House. “I maintain, as Americans have believed since the American founding, that firearms in the hands of law-abiding citizens make communities safer, not less safe,” Rep. Mike Pence, told me then. “I think, particularly in Washington, D.C., the desire is to move immediately off and find something else to blame, and find some public policy that’s wanting.” Crying “politicization,” in that case, helped tamp down talk of a gun bill that was never going to pass anyway. Did any gun legislation actually pass in the wake of the Giffords shooting? Yes. Arizona made the Colt revolver the official “state gun.” But legislators failed to pass a bill allowing community college professors to carry guns on campus. James Holmes, the suspect arrested in connection with the mass shootings at a screening of the new Batman movie early this morning in Aurora, CO, could be a registered Democrat, according to documents obtained by Breitbart News… The James Holmes for whom Breitbart News has obtained documentation is 25 years old (the suspect has been reported as 24 years old). He has links to addresses in both Colorado and San Diego, where his mother has been reported to be from, according to news reports. He was issued a traffic citation in 2011–his sole run-in with the law. The same is true for the suspect arrested in connection with the shootings, according to reports. What would it mean if he was a Democrat? What would it have meant if he was a Tea Partier? Probably nothing. Some killers put out manifestos explaining why they did it. Some are psychopaths who go through some of the motions of ordinary life – showing up at events, voting – before snapping and committing a non-ideological crime. Jared Loughner shot a congresswoman because he believed that money wasn’t real. 3.) Say whatever the hell you want about guns. I see Chris Cillizza’s getting criticized for writing a well-researched story about whether gun tragedies affect public opinion of guns. (Short version: There are vastly different KINDS of tragedies, but, no.) Lay off! The only time Americans ever talk about gun laws or the effects of gun laws is after tragedies. We learn whether Concealed Carry Laws would have prevented various crimes, like in April, when an off-duty security guard stopped a killer cold with his CCW in an Aurora church. We learn their limitations – like in this case, where an armed citizen in a dark, smoke-filled theater might have ended up shooting the wrong people by accident.